The Health-O-Meter® Model 400KL* is a 390 pound/180Kg capacity balance beam column scale from Health-O-Meter®, one of the worlds leading manufacturers of personal and professional scales. Tough and reliable, this balance beam scale is built to last for years in even the most demanding weighing applications. No need for batteries or A/C adapters. 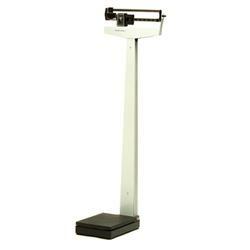 The scales easy to read dual poise balance beam weighing mechanism makes weighing fast and easy. If you need to measure height as well as weight consider the Model 402KL, an identical performing scale with a height measuring rod. Great Design - the Health-O-Meter® family of balance beam scales are a gold standard of clinical weighing with hundreds of thousands of units in use year after year in clinics around the world. High Accuracy - The Health-O-Meter® balance beam scales weighing mechanism has been refined and field proven for years and is accurate over the full measuring range of 390 pounds/180 Kg in increments of 0.25 pound/100 g. The Model 400KLs capacity can be increased to 490 pounds/ 210 Kg with scale capacity extenders (not included). Large weighing platform - the 10-1/2" x 14" weighing platform is covered with a non-slip cover. Built strong - the scale weighing mechanism is manufactured using high strength hardened steel pivots and bearings and the entire scale is fabricated using steel and cast iron for high strength and long life. Dual mode - the balance beams include markings for both English (lb) and metric (Kg) units. If you only need English units consider the Model 402LB, an identical performing scale with an English (lb) only beam. Warranty -Ten year limited warranty . This is a high quality balance beam scale that is equally at home in the clinic, hospital, health club, school or family bathroom. Built to last by one of the worlds leading scale manufacturers, this scale will give you many years of trouble free service.